The players were still quite pleasant to each other so there were very few player-versus-player combats. I tried but just couldn’t succeed at my scouting roll when it mattered so my “easy prey” human opponent managed to slip by me; however, we did have a couple of fights. First, one player totally destroyed my already very badly damaged ship as I’d just completed a couple of merchant raids. Their seamanship skill of 3 versus my 1 made it an easy win (I couldn’t use my seamanship of 2 because they had a bounty on them). In the other fight, an NPC pirate attacked a player (but the NPC finally managed to escape). The two things we learnt from these battles were: (a) It’s very hard to flee from a battle (not impossible but pretty tough), and (b) seamanship skill is the most important factor and makes a massive difference. It led me to think that I’d like a way to increase the captain’s stats as these can hold you back. You may have a superb ship, which can take and/or deal damage, but that doesn’t change your chances of being able to take an action during a fight (like shooting), and doesn’t make it easier to find a ship to fight in the first place. Some of the glory cards let you re-roll dice in some tests (whether as a one-off or by hiring a specialist) but these are randomly drawn, so it would be nice to be able to upgrade your captain’s stats. During my first play of Merchants & Marauders, I played a law-abiding merchant and won quite convincingly primarily through trade. When I played yesterday, I wanted to try being an all-out pirate. One player tried this last game and found the merchant raids very difficult. You may succeed in stealing a merchant’s goods and gold, but you only gain a Glory point (required to win the game) if you earn 12 or more gold from a single raid. The game’s designer (Christian) suggested using special weapons to affect more cards drawn during a successful merchant raid. However, even using special weapons, I still found it difficult to get 12 gold out of a merchant raid, plus each special weapon used cost me 3 gold too. Compounding this is the issue that it’s hard to accumulate gold as a pirate because you spend a lot repairing battle damage (plus replacing special weapons). It seems easier to gain gold and glory through trade compared to merchant raids. With limited gold, it’s hard to obtain rumours, goods, ship enhancements, or a new ship. At the start of the game, I chose the sloop ship because of its high maneuverability (meaning merchants don’t escape easily), but it’s very weak in all other areas so needs to enter port after most fights (or run the risk of being sunk in the next). You can’t score glory points for trade (meaning fewer glory cards too) because of the limited cargo space (which also means less potential trade income). Also, attacking a player who has bought one of the bigger ships is difficult because they can take and deal more damage. So, the sloop’s disadvantages seem to outweigh its advantages. My experience has made me think I should approach the game a different way. It’s not about being a pirate or being a merchant, but about being a mixture of the two. In future, I think I’ll take the flute to start with (tougher, bigger cargo hold but less maneuverable) and focus on earning gold through trade (with the occasional opportunistic merchant raid) so I can buy one of the bigger, seriously chunky ships as soon as possible. Then, I can choose to be a real pirate threat and attack naval ships and players (if I wish), but still with the ability to trade convincingly too. Also, I won’t buy many ship upgrades (if any) for my first ship as these are usually lost when upgrading to the bigger ship, so I think it might be best to save the cash to buy the bigger ship first. The items above aren’t negatives (although I do think the sloop’s too weak) but are just what I’ve learnt about the game. It’s an excellent pirate game. I’d love to hear what other people’s experiences have been. 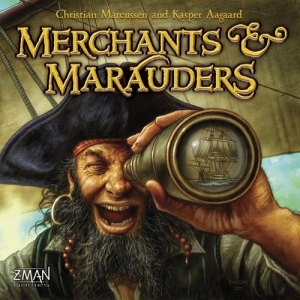 This entry was posted on Monday, November 22nd, 2010 at 2:10 am	and is filed under Board Games, Essen Spiel 10, Merchants & Marauders, Replay. You can follow any responses to this entry through the RSS 2.0 feed. You can leave a response, or trackback from your own site.